Investing for your own future takes a lot of time, skill and expertise. It’s not impossible, but it can be difficult knowing you’re making the right decisions with your money when the geopolitical and economic backdrop is uncertain. Understanding your investor profile and appetite for risk is one of the first steps in building a portfolio that will help your money grow over the long-term. Yet it’s not an easy task identifying your investor profile and deciding how to reflect this and the evolving geopolitical and economic environment through the allocation of assets in your portfolio. 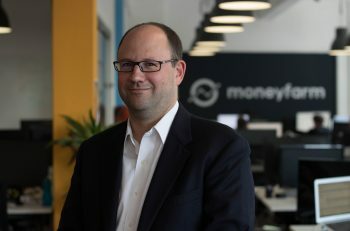 At Moneyfarm, our experienced investment team build and manage the investment portfolios for our investors to ensure they reflect our investor profiles. Whilst we use passive Exchange Traded Funds to build our portfolios, we certainly adopt an active management style. When investing, one of the largest barriers to you reaching your goals is diverting from your investment strategy. Short-term fluctuations in the financial markets can make investors feel backed into a corner, under pressure to make an investment decision to avoid losing money. Volatility is uncomfortable to sit through and it can lead both newer and experienced investors to try and time the market. However, it’s time in the market, not timing, that can really help maximise your returns over the long run. 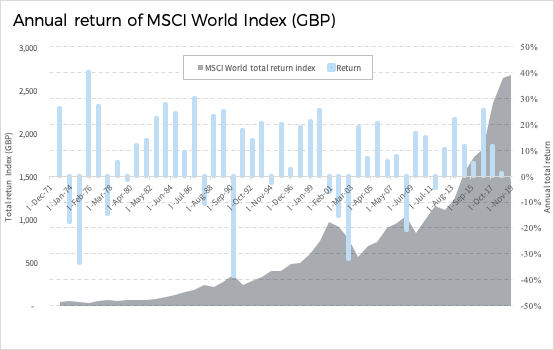 Look at the chart above as an example, which reflects the performance of the MSCI World Index since 1971. Whilst the annual return has swung from positive to negative over this period, the underlying performance trend of the index has been positive. If you’d have invested £100 in 1971, you’d have just shy of £2,750 today. By sitting through the worst annual performance of -40% in 1990, and others, your portfolio would have returned 2,650%. As the best and worst days in the market are usually clustered around the same time¹, it’s easy to miss the best days of performance by trying to avoid the worst. And this can have a real impact on your overall portfolio performance. For example, if you’d invested $10,000 on 1 January 1998 and left it tracking the S&P 500 until the 30 December 2017, your portfolio would be worth $40,135, research from JP Morgan shows. This is more-than double the $20,030 you would have if you missed just the 10 best days in the market. Miss the best 60 days and performance slips to -6% to just over $2,834. Even when you have a long-term horizon and enlist the experts to manage your investments for you, understanding what’s driving the performance of your investments can give you the confidence to stick to your long-term investment strategy. There are key themes underpinning global financial markets, including global trade, Brexit, monetary policy. Watch November’s monthly market update from Chief Investment Officer Richard Flax. Markets had some light relief earlier this week on news that a trade deal had been agreed in principle between China and the US. China agreed to increase their purchases of American products, whilst America agreed to halt its increase in tariffs from 10% to 25% on around $200 billion of Chinese goods. However, talk of a trade agreement may have been a bit premature, especially with the appointment of Robert Lighthizer, to head up the negotiations. He’s unlikely to give China an easy ride. Then the Canadian government arrested the Chief Financial Officer of one of China’s national technology companies, Huawei. Accused of breaching US sanctions against Iran, the arrest came at the request of the US – although it wasn’t necessarily Trump who made the call. Extraditing corporate executives is unusual and it’s not far-fetched to assume there will be some form of retaliation if it isn’t resolved. Whilst not directly a trade issue, the move shows the complexity of the rivalry between China and the US. If the last week is a sign of things to come, the path to trade deal between the pair next year is unlikely to be quiet, and markets are likely to be tested. Even so, we do expect a solution to emerge as China and the US are so economically intertwined. The Fed’s path of gradually raising interest rates has come under increasing focus from markets. In November, Fed Chair Jay Powell hiked interest rates, as expected, but it was his commentary that held the takeaways. Whilst interest rates are still in line to rise in December, the Fed Chair is considering taking his foot of the accelerator in 2019. This will give the Fed more time to evaluate the impact of higher rates. Interest rates may still be low by historical standards, but they’ve gone quite a long way up from the post-crisis trough. Financial markets pay attention to noise like this, with the S&P 500 rallying and expectations for rate hikes in 2019 weakening. However, this isn’t a dramatic shift in policy from Powell. And even if the Fed were to pause in early 2019, signs of accelerating wage growth could easily cause another shift in view. It’s also difficult to ignore the recent flattening of the yield curve seen in the Treasury bond market. It’s not easy keeping up with the Brexit story, but, as it stands, Parliament is set to vote on Theresa May’s Brexit deal on 11 December. It’s uncertain whether she will win the vote, and what will happen if she doesn’t. There are three main options in the latter scenario; the deal gets passed in a second vote after markets wobble, parliament takes control of the process with the potential for a second referendum, or a vote of no confidence could trigger a General Election. As we sit here today, it seems that the probability of no-deal is falling – thanks largely to amendments passed in parliament. That’s good news for UK financial assets, in our view. It probably cuts the downside risk. Short-term fluctuations are expected when investing in the financial markets. Whilst volatility has picked up, the MSCI World’s yo-yoing has been locked in a trading channel set since mid-October. Despite geopolitical tensions, there hasn’t been a shift in global economic growth forecasts, which should provide a floor for equity valuations. We’re currently revisiting our strategic asset allocation, an annual event, and we’ll let you know how our strategy changes. The Moneyfarm portfolios are relatively conservatively positioned at the moment and we think that that makes sense. If you’d like to talk about the performance of your portfolio, your asset allocation, or have any questions about the market, book a call with one of our Investment Consultants today. Next article What is a yield curve and what does it show?